HI John, I listen to your segment on a Sunday afternoon on 2UE regularly and was hoping to get your opinion on something. Today my wife and I have been out looking for a mid-size SUV. I think we have shortlisted three cars (but am open to your suggestions): Hyundai ix35 Trophy, Kia Sportage Si Premium and the Nissan Qashqai. I'm interested on your thoughts and if there is anything that is better value? I'm open to a demo car or late model secondhand but am planning on leasing the car (if that makes a difference). Any info would be great. Thanks, David. I will get the brokerage to call you today to discuss the upcoming purchase. My strong advice is, if possible, seriously consider either the 2.5i (petrol) or 2.2TT (diesel) Mazda CX-5 AWD (that engine comes in model grades Maxx Sport & above) when you test drive this weekend. But remember what I said over the phone about i-Stop. It's hateful, and you can only ever half-disable it. Hi John, we spoke a little over a month ago about a couple of SUV options and I wanted to let you know how I went. After your feedback we have decided on the Mazda CX5 Akera petrol, which ticks all the boxes for us (especially with the added safety features). I spoke to Ben at the brokerage but as I'm finding a price but as i'm purchasing it through my employers novated lease agreement we couldn't really progress. I was hoping you could give an indication if the price I'm being offered is reasonable. For the CX-5 Akera with floor mats, roof racks and tinted windows in the Soul Red colour the leasing consultant has a price of about $46,500 drive away - do you think this sounds reasonable? I understand the RRP is about $51,000. Thanks for all your help, David. Get yourself a quote on the regular, all-up drive-away price, or use the cost calculator at Mazda.com.au, then take away the GST. (Novated leases are GST-free because the GST is an input credit as far as the leasing company is concerned.) Then you’ll see what the discount he’s offering is. 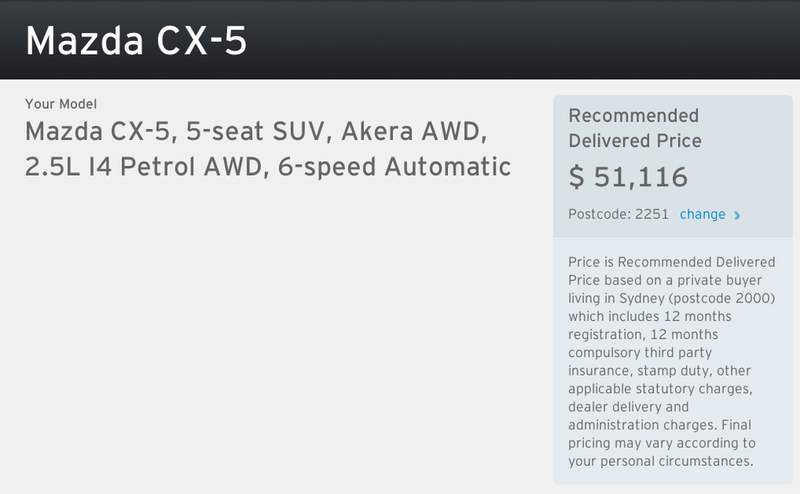 My rough assessment is: The CX-5 Akera petrol without any accessories is $51,116 drive-away, according to Mazda. If we allowed $1500 for the accessories (mats, racks, tint and $200 for the red) you'd be at $53,000 (say). The GST on $53k is around $4800 - so the GST-free price is about $48,000. Essentially you're being offered a $1500 (ish) discount. I'd have to say that's not much of a saving (less than three per cent off). I think you could get that car below $45,000 without too much trouble (GST-free).